Boettcher Foundation hosts scholar alumni reception in D.C.
Boettcher Foundation Staff recently traveled to Washington, D.C. to visit Boettcher Scholar alumni whose diverse careers and passions took them to the East Coast. 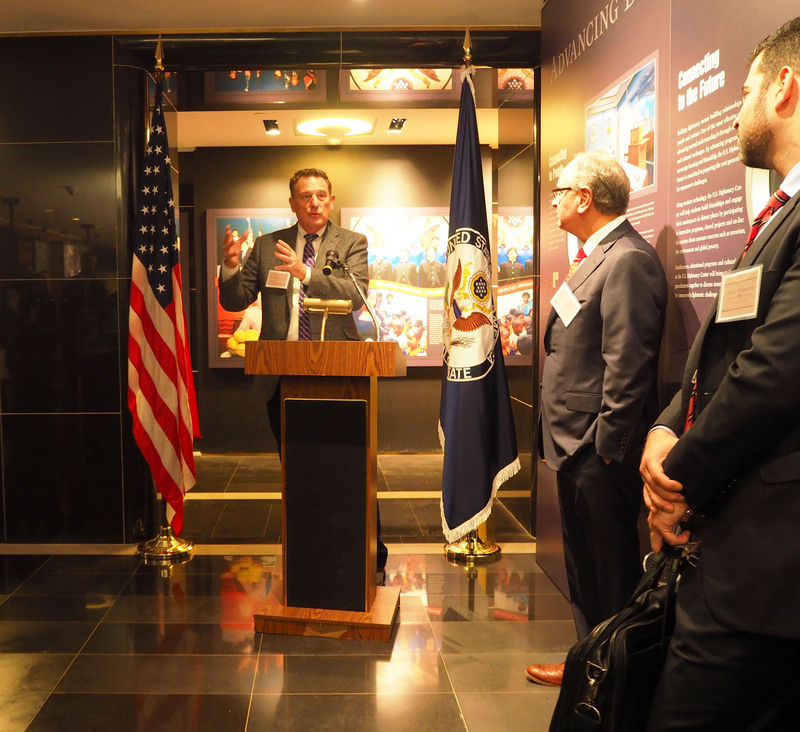 While there, we had the chance to reconnect with the impressive alumni who live in the D.C. area at a reception hosted by the U.S. State Department and by the Director General of the Foreign Service Arnold Chacon (who also happens to be a Boettcher Scholar). Tim Schultz at the D.C. alumni reception. In an increasingly globalized world, we’ve been focused on reconnecting with scholar alumni, wherever they may live, because we believe we can all serve our communities more effectively if we’re linked to one another. Many of the alumni who live in the D.C. area have careers in public service, nonprofit and government. Alumni attendees ranged from 1965 Boettcher Scholars to recent college graduates. Among them were Tracy Wahl, executive producer for editorial franchises at NPR and Boettcher Scholar Alumni Board member; Phillip Juengst, federal financial manager for the U.S. Department of Education; and several members of the Foreign Service. The alumni reception was hosted at what will soon be the U.S. Diplomacy Museum, and we were joined by Foreign Service fellows and directors from the U.S. Bureau of Human Resources. “What makes this event very special is that both the alumni and the State Department employees share the value of giving back and making a difference in our communities, whether that’s Colorado, the United States or the world,” said Tim Schultz, president and executive director of the Boettcher Foundation during his remarks at the reception. Not only did we have a chance to catch up with our D.C. alumni, we also talked about ways for them to stay connected with the Boettcher community, even from afar. We also discussed opportunities with Director General Chacon’s team, including possible internships and fellowships for Boettcher Scholars. During the reception, Director General Chacon mentioned the profound connection he has felt to the Boettcher community since receiving his scholarship in 1974, and that he is glad to share that bond with 2,400 other alumni. These regional receptions offer a way for us to gather scholar alumni, share great conversations and continue to build our community. “I was grateful to connect with scholar alumni in the D.C. area as well as state department staff and fellows and learn more about the great work happening in all of our communities,” said 2004 scholar Mackenzie Parker. We host these receptions several times a year, in cities across the country. If you’re an alum outside of the Denver-metro area, make sure your contact information is updated so we know where to find you and watch our Boettcher Scholars Facebook page for updates on where we’ll be travelling next! Boettcher Scholar Alumni in D.C.